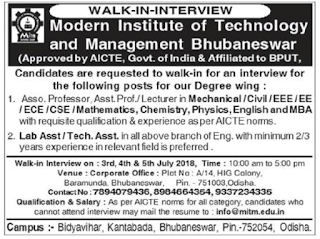 Modern Institute of Technology and Management, Bhubaneswar has advertised in the SAMAJA newspaper for recruitment of Teaching Faculty- Lecturer, Assistant Professor, Associate Professor,Non Teaching Faculty jobs vacancies. Interested and eligible job aspirants are requested to attend walk-in interview on 3rd,4th,5th July 2018. Check out further more details below. 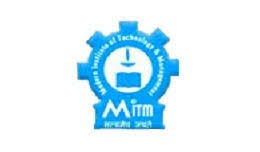 Name of the College : Modern Institute of Technology and Management, Bhubaneswar. About College: MITM is one of the most reputed educational institution of Odisha having excellency in technical education , research and Management. Founded by a visionary professor Dr.K C Dash , who during his professional carrier as an educationist has been a guiding force for many successful technocrats and management professionals. The trustees behind MITM are from top end management and education background. Knowledge , skill , acumen coupled with a strong passion and desire to provide quality education has given birth to this wonderful institution. Assoc. Prof, Asst. Prof, Lecturer: With requisite qualifications and experience as per AICTE norms. Lab Assistant/Tech Asst: with minimum 2-3years of experience in relevant field is preferred. As per AICTE norms for all category. 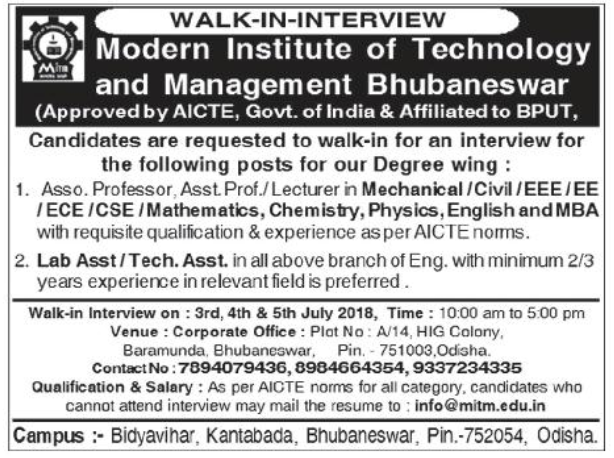 Reference: Recruitment Notification / Career Job Opportunities notice for Teaching Faculty - Lecturer, Assistant Professor, Associate Professor non teaching faculty on Samaja newspaper Dated 2nd July 2018.